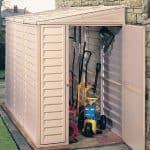 With the Keter Fortis plastic garden shed your outdoor storage issues will be a thing of the past. 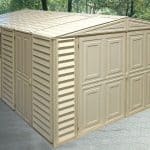 Boasting an impressive 8x11ft shed interior, storing your family’s outdoor and garden items is easy with this maintenance-free plastic shed. This is a superb plastic garden shed which is attractive in design as it is functional. Large, double doors allow ease of access to all your gardening equipment and there is a pretty feature window giving light inside as well as a vent for circulation. Made from strong polypropylene resin it is weather resistant and maintenance free retaining its good looks for many years. This works just as well as a workshop where you can potter around planting or tinkering with your lawnmower as it does for storage. With an 8x11ft shed interior, storing all of your garden and outdoor tools, accessories, furniture and toys isn’t a problem. Interior storage solutions including freestanding shelving may enable you to increase storage space further and store your items neatly. 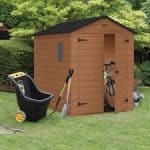 This superb shed will last for many years to come within your garden with its tough plastic exterior resisting even the toughest weather conditions. The Keter Fortis Plastic Shed is a fine example of how a plastic shed can meet all of your expectations, both with its aesthetic appearance and the high quality materials from which it is constructed. 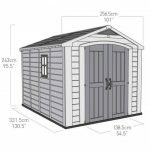 In this section we take a more detailed look at the many features that this particular model of shed provides and see if it would be suited to you and your outdoor storage needs. Exterior: The shed exterior is constructed from tough plastic panels. 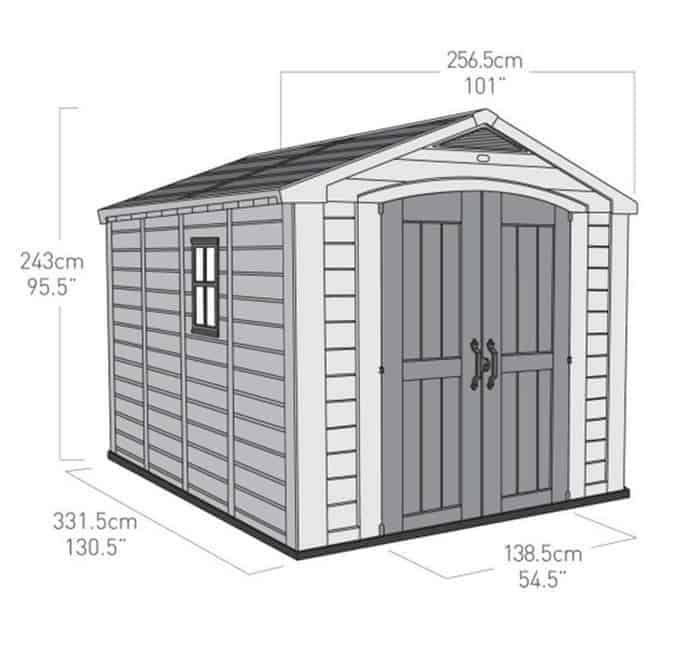 With a wall thickness of 16mm and a steel-reinforced structure, this sturdy and durable shed will be standing in your garden for many years to come. Interior: The 8x11ft shed interior is ample storage space for all of your outdoor and garden equipment. It could also be a fantastic garden workshop if that is what you require. Additional storage space can be created with the use of freestanding shelving for those smaller items that you wish to store neatly. Doors: The tall and wide double doors provide easy accessibility for even the largest of items such as lawnmowers and bikes. The doors come complete with a locking hasp to allow you to add a padlock for security reasons. Window: The fixed window does not open and close however, along with the skylight, allows light to stream inside. Security: The Fortis shed comes complete with a locking fixture in place, enabling you to add a padlock to keep your items secure. A padlock is not included but may be purchased at a modest price separately. 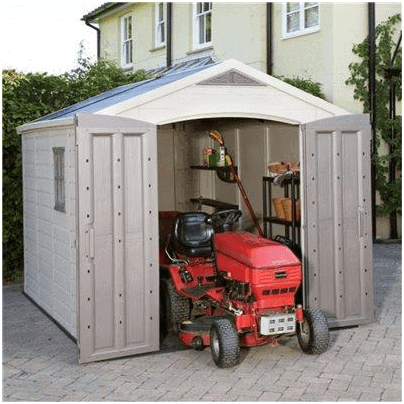 The Keter Garden Storage Fortis Plastic Garden Shed: How easy to build? 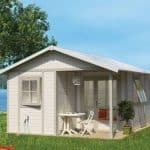 The Keter Fortis shed benefits from easy assembly – something which you will no doubt appreciate if you are a novice when it comes to anything DIY. Assembly is a relatively simple process due to the clear and easy-to-follow instructions. Following them step-by-step we expect that this particular model could be erected within a day. It is the manufacturer’s recommendation that two people work together to assemble the shed, both for safety reasons and due to the size of the parts and plastic panels. Your shed will be flat-packed and complete with all the fixtures and fittings needed for assembly. A basic set of tools will be required. 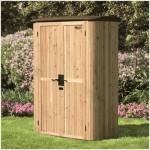 The Keter Garden Storage Fortis Plastic Garden Shed: What is the overall quality like? Keter is a brand known for providing high quality garden sheds and storage solutions for a range of needs and budgets. 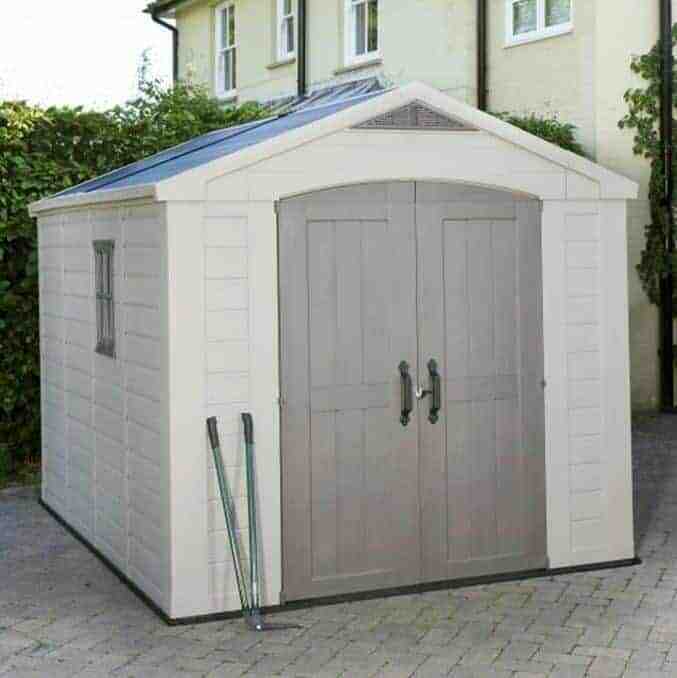 The Keter Fortis shed provides a fantastic storage space for your outdoor and garden tools, furniture, toys and bikes, as well as having the potential to be a wonderful garden workshop also. The strong plastic and reinforced steel structure of the Fortis shed makes it a serious contender against the traditional wooden or metal shed. With a vent for air circulation, your items will be protected from the elements as well as damp and mould. A window and skylight allows light to enter the shed as well as providing visibility for security reasons. Maintenance free, the Fortis shed is an excellent option for the busy family and their storage needs. The Keter Fortis Plastic Shed offers an impressive list of features that makes it stand head and shoulders above the other sheds in its category. Its 8x11ft interior provides a spacious facility in which you can store your garden and outdoor items knowing that they will be secure and protected from the elements. 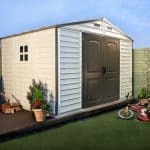 With a great looking exterior and the added benefit of being maintenance free due to the strong plastic used in construction, this fantastic shed is well worth the price tag.